As the BRICS countries struggle for influence, Russian experts assess the problems the emerging geopolitical bloc faces. The BRICS Summit held in New Delhi last month did not produce any major surprises or sensations, but it did prove conclusively that the strongest nations in the developing world are eager to achieve unity. China, Russia, India, Brazil and South Africa are gaining strength by the year, and their ability to influence global matters is growing, something that Goldman Sachs’ Jim O'Neill predicted when he coined the BRIC acronym 10 years ago (last year, South Africa added the “S” to BRIC). These countries will not in the long term put up with the current world order, based as it is on the dollar as the global currency and use of force without international consensus. But the goals of the BRICS countries should not be misunderstood. Their aim is to protect the interests of developing economies rather than attack the traditional center of power led by the United States. During the New Delhi Summit, the main BRICS banks signed an agreement to finance projects in the member-states in national currencies. The agreement provides for the creation of mechanisms for settling accounts and financing projects in national currencies between authorized BRICS banks. With the exception of the Council for Mutual Economic Assistance – the economic integration organization in the former Soviet bloc, which ceased to exist in 1991 – BRICS will be the first post-World War II structure to create an international financial institution using currencies other than the dollar. 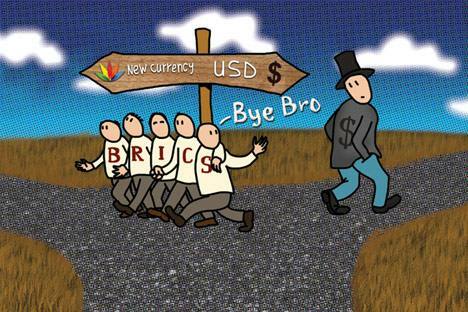 This does not mean, though, that the BRICS economies will give up on the dollar – rather, the bloc will attempt to reduce the dollar’s role in these countries and weaken the influence of the U.S. Federal Reserve System on their economies. At the New Delhi summit, the BRICS countries also made a move towards unity on foreign policy issues. The BRICS’ stance generally differs dramatically from that of the United States and its allies, although the views of the BRICS nations often differ from each other. Russia and China vetoed the UN Security Council resolution on Syria since it contained loopholes that would allow military intervention in Syria’s internal affairs. India voted in favor of the resolution. Nevertheless, the New Delhi BRICS Summit called for the conflict in Syria to be settled exclusively by means of negotiations. This position was emphasized by the host of the summit, Indian Prime Minister Manmohan Singh, when commenting on the results of the summit. The group’s joint statement on Iran was even more categorical. “We recognize Iran’s right to peaceful use of nuclear energy consistent with its international obligations and support resolution of the issues involved by political and diplomatic means and dialogue between the parties concerned, including between the IAEA and Iran, and in accordance with the provisions of the relevant UN Security Council resolutions,” said the joint resolution. About an attack on Iran, the BRICS said: “The situation concerning Iran cannot be allowed to escalate into conflict, the disastrous consequences of which would be in no one’s interest.” All the BRICS economies ignore sanctions against Iran, such as the oil embargo, that are not formalized in UN resolutions. It is obvious that the BRICS consolidated position on the most pressing issues on the international agenda is, for the most part, a response to the methods of force employed against countries that fail to march in step with the leaders of the western world. BRICS, too, often marches to the beat of a different drummer – hence its attempts to stipulate preventive collective security rules in international politics. This is definitely a trend, too. International media eagerly discuss whether BRICS is strong enough and whether the trends demonstrated by the group are stable enough for the organization to have any influence. Another problem that persistently referred to in speeches about sources of internal contradictions in BRICS is the Indian-Chinese spat over state border issues. No one denies this fact, but the sheer scope of the BRICS nations’ ambition goes beyond border conflicts. And these two countries have already shown they can get along within the G20 framework. Until recently, Western politicians were openly skeptical about the prospect of BRICS emerging as a geopolitical force in its own right. The group was thought to be too disparate for its members to be able to form a bloc. The BRICS leaders do not underestimate the challenges facing the group. The countries that form it differ widely in terms of internal organization and the state of their economies. They are in different weight categories in the world economy and they are beholden to their traditional links with their Western partners. Nor can the problems between these states be ignored, for example, the border disputes between China and India, differences over Pakistan and Tibet, and imbalances in mutual trade. And there are still differences in the approaches to key aspects of international politics. China and Russia voted against the UN General Assembly resolution on Syria that called on Bashar Assad to resign, while India, Brazil and South Africa voted for it. Last year, the group was unable to agree on a common candidate to head the IMF and they could not form a common position on greenhouse gas emissions at the Copenhagen conference. These are just some of the factors that hinder the unification of these states’ efforts. Even so, the Delhi summit demonstrated for the first time that a rapprochement is beginning. In the eyes of the whole world, a new process is unfolding as young and dynamic development forces are confronted with an outdated and unjust world political and economic order and begin to unite in order to shake it up. The Declaration issued by the Delhi summit leaves no doubt that the process of unification within BRICS has entered the phase of formulating common interests and preparing concrete joint actions in the world. “Our discussions were conducted in an atmosphere of cordiality and warmth and inspired by a shared desire to further strengthen our partnership for common development and take our cooperation forward on the basis of openness, solidarity, mutual understanding and trust,” said the declaration, in part. During the summit, the parties identified new areas of cooperation for study. These include multilateral energy cooperation, a common scientific assessment and long-term strategy for BRICS, dialogue on BRICS youth policy, as well as cooperation on population issues. The summit was also presented with a report on BRICS economies. These are issues that must result in coordinated joint actions in order to protect national interests. The BRICS leaders also expressed a categorical dissatisfaction with the policy of Western financial institutions. In their opinion, the reform of these institutions is unsatisfactory and ignores the group’s interests. The BRICS leaders decided to develop a project for their own development bank that would mitigate the damage caused to their countries by the West’s financial policy. An agreement was signed on the system of settlements in national currencies, aimed at gaining ground on and eventually replacing the dollar in settlements between these countries. The BRICS finance ministers were instructed to prepare proposals on the development bank by the next summit. Internal trade within BRICS now stands at $230 billion, but there is every chance that it will soon reach $500 billion. For the first time in recent history, a powerful financial structure will emerge that serves international trade without the dollar. The BRICS leaders also discussed major global political problems. They noted the disproportionate representation of nations and continents in the UN Security Council and Russia indicated that it would back the candidacies of Brazil, India and South Africa for permanent membership. The summit’s statement that the UN could not be used to cover up the course of toppling undesirable regimes and the imposition of unilateral formats for the resolution of conflict situations came as a stern warning to NATO strategists who harbor plans for drastic political surgery. A consolidated position also emerged for preventing aggression against Iran. China, India and South Africa import between 12 and 20 percent of their oil from Iran. “We must avoid political disruptions that create volatilities in global energy markets and affect trade flows,” said Indian Prime Minister Manmohan Singh. He was backed by Brazil’s President Dilma Roussef who condemned the embargo against Iran and the escalation of pro-violence rhetoric. Considering that Israeli Prime Minister Benjamin Netanyahu recently expressed his intention to attack Iran’s nuclear facilities, it is clear that two radically different approaches to shaping the international agenda are emerging. And BRICS is already becoming the force that offers an alternative to the Western approach. This did not go unnoticed in the West; the Washington Post called the summit “the beginning of a new era.” That BRICS has common fundamental interests is a reality that will determine the further consolidation of the group. It may evolve into an alliance capable of proposing a new, more modern and equitable world order. Dmitry Sedov is an expert from the Strategic Culture Foundation, the think tank dealing with foreign affairs.